is professor of history at the centre for environmental history at the Australian National University in Canberra. His latest book is Slicing the Silence (2007). When I emerged for breakfast in my Venice hotel, a stylish establishment with fine furnishings and carpets, and a garden courtyard, there was a stench. Salt, sewage and seaweed had combined in a thick, rising miasma. The beautiful, ornate staircase led down to chaos. A round-faced, dark-haired boy aged about 10 stood at the top of the stairs, staring with some excitement down into the mess. He was a fellow guest and when he saw me about to descend, he pronounced solemnly: ‘Breakfast’s been cancelled. The kitchen’s flooded.’ Food deliveries had been disrupted, cooking was impossible, voices were raised. Water had risen up from the foundations. The cobbled streets of Venice had become shallow canals. The same street-sellers who were flogging bags and trinkets yesterday were touting thigh-length plastic boots today. Outside the door of the hotel, people were ploughing through water up to their calves, tourists were stumbling towards their travel deadlines with suitcases above their heads, and in the Piazza San Marco they were up to their waists in seawater. Youngsters could swim under the campanile. Even on days of normal tides, the Basilica di San Marco looks like a coral-encrusted jewellery box hauled up from the depths, a Neptune’s Palace cast in the corner of the square. The sea washed through it this day in an attempt to reclaim it, leaving the beautiful floor tiles glistening with its longing. Venice is wedded to the Adriatic and the lagoon is its bridal bed. A thousand years ago, the Doge Pietro Orseolo II took his triumphant naval fleet to the sea entrance at the Lido and ceremoniously threw a diamond ring into the water, thus marrying his city to the Adriatic and securing Venice’s dominion over its waters and trade routes. Hundreds of rings are now somewhere in the mud and at least one was found inside a fish. The Bride of the Adriatic is built on the remnants of the Brenta river delta. She rests on mud, clay, stone and a forest of chestnut logs, and is protected from the sea by sand bars and sea walls. High tides have always threatened and enlivened the city and its lagoon. But the acqua alta (an exceptional tide peak) has occurred much more frequently since the record sea flood of November 1966. In Venice: A New History (2012), Thomas Madden writes that it has occurred ‘50 times a year since 1980, and sometimes much more often’. The event I witnessed this month was the sixth highest ever recorded and it flooded three-quarters of the city. It is the lagoon brimming into your home. Locals insist that this is a ‘high tide’ not a ‘flood’. This is a geographical truth, but perhaps it is also a rhetorical strategy, an assertion of normalcy and routine in the face of peril. I can report that there was no talk of climate change in front of tourists on the morning after the high tide created a swimming pool of the piazza. We had all been given some intimation of the trouble. In the early hours of Sunday 11 November, my sleep was disturbed by the siren that warns the whole of Venice of threatening tides. Its whine was followed by musical notes indicating the expected tide level. There were three rising notes, and later, when the siren sounded again, there were four. Three notes means that the incoming tide will reach 1.3 metres above the normal average sea level; four means 1.4. It peaked at 1.49, within just one centimetre of the fifth note. These figures were the talk of the city the following day: ‘120 is all right; but 150 is very difficult,’ said the Venetians with furrowed brows and thrown-up arms. ‘Venice is beautiful,’ said another who had spent the morning sweeping and washing out her shop, ‘but the water is a problem!’ That is the nature of life in the lagoon and, as the locals say, its water is very wet. On this occasion, the tide was high, it had rained, and — most importantly — the sirocco was blowing. The warm south wind from Africa pushed more water into the lagoon than had been expected. The locals could not forgive the late and inadequate warnings from the authorities. ‘They’ had predicted 120 and it was actually 150; the next night ‘they’ predicted 130 and it was 105. ‘They need more study,’ a young Venetian waiter told me as the sea receded. There is to be a flood barrier system, known by the ingenious acronym ‘MOSE’ (Modulo Sperimentale Elettromeccanico), the Italian for Moses. It aims to part the seas by separating the lagoon and the wider Adriatic with mobile gates at exceptional high tides, and is expected to come into operation in 2015. When Goethe visited Venice for just over two weeks in 1786, he climbed the campanile twice, at high tide and then at low tide. It was from this tower that, at the age of 37 and already famous, he saw the sea for the first time in his life. It was Goethe’s habit to find a prospect upon any new place he visited, and he knew that Venice — which John Ruskin would later call the ‘Queen of Marble and of Mud’ — had at least two different states, each of which was to be appreciated and studied: awash, and emptied. So Goethe made the second ascent near the end of his visit and contemplated the bared soul of the lagoon, ‘a large greenish-grey morass intersected by channels’. Although Venice was evidently sinking, he was reassured by the belief that there had been, and would continue to be, a ‘gradual fall in level of the primeval ocean’. The prospects of this ‘beaver-republic’ were, he felt, good. But others worried that the retreat of the sea, together with accumulating silt from the rivers flowing into the lagoon, might leave Venice beached and stranded. Jan Morris, in her brilliantly evocative portrait of Venice published in 1960, told us that ‘floods’ are a phenomenon of modern times, and that high tides in earlier centuries never broached San Marco. A vigorous high tide is cleansing but it also animates the city’s ‘smell of mud, incense, fish, age, filth and velvet’. At the time, the city was known to be sinking but Morris also reported the reality of steadily rising water due to ‘volcanic heavings underground’. Some human causes of flooding were recognised, too — the dredging of entrances to the lagoon, the deepening of canals and the diversion of rivers had all affected the delicate balance between water and earth. But there was, as yet, no sense of the global imbalance brewing. In the 50 years since Morris’s book on Venice, we have learned about rising average global temperatures, the vulnerability of Arctic ice and the sheer scale of the Antarctic ice cap, and now we know for sure that the ocean is rising faster than Venice will subside. A millennium of Venetians, even though they have lived constantly with the power of the lagoon, defending their hard-won land from the threatening and sustaining sea, did not know how stark the odds against them would become. The lagoon, created by the ending of the last ice age, might now be signalling the next geological era, the Anthropocene. Venice and New York, both great mercantile cities wedded to the sea, have been inundated this past month. In these ways, perhaps, a subtle and significant shift in history declares itself. 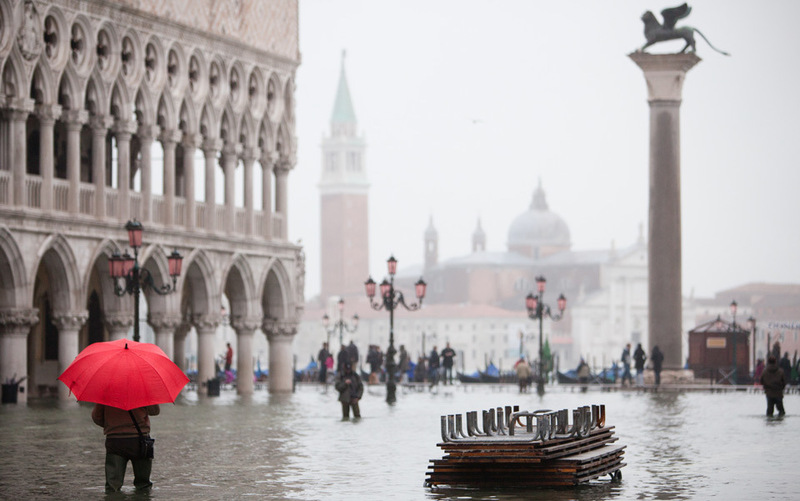 Alessandro Maggioni, Venice’s assessor for public works, described the recent acqua alta as ‘exceptional and unpredictable’, and was reported in the Guardian as denying that there is a rise in the incidence of high waters. Of course, it was an official shrug, a statement that avoided accountability and liability. But Maggioni was also eager to distinguish the exceptional so as to preserve ‘the normal’. It reminded me of those Australian government officials who in the early 20th century did not include drought years in the calculation of average annual rainfall. Unpredictability and exceptionality are sometimes seen to diminish our responsibility, yet they are the most predictable outcomes of the climate change we have initiated. The high tide this month in the Adriatic offers us a glimpse of what living at a time of climate change looks and feels like. A crisis wakes us in the night; a youthful oracle greets us in the morning; breakfast is cancelled. Officials equivocate. There is much mopping up, much resilience, and much talk of history. The emergency is real but incremental. It seems just within or just beyond the boundaries of experience or memory, and so it strikes us initially as more an exaggeration of the past than an initiation into our new, and uncertain, future.